All children are born with flat foot and are universally flat-footed when they start walikng [1,2]. Foot abnormalities of children are always considered as a confusing puzzle for their parents. Young children and adolescents refer to pediatrics to evaluate their feet and gait abnormalities. Among foot problems, flat foot is the most common. Parents are worry about the flat appearance of their child’s feet. The most commonly questions they concern are: “Does the foot problems get worse in adulthood?” and “Are the deformities correctable with orthosis or medical shoes?”, if so, how long does the problem take to be alleviated? Foot abnormalities potentially cause major secondary problems. Excessive stretching and transferring weight to lateral edge of foot to compensate flat foot result in secondary complications such as: hammer toe, plantar warts, heel spur, overstretching of medial longitudinal arch, joint laxity, foot imbalances, early fatigue, and feeling pain at hip, knee, and shin during physical activities [3-6]. Cohen-Sobel  and Amico et al.,  implied that flat foot may cause gait disorders in the future. Several epidemiologic studies were performed all round the world about the prevalence of foot problems. The flat foot incidence was 23% in Canada and 0.6 % in Niger [9-12]. Early diagnosis of the problems, before the skeletal maturation, prevents skeletal abnormalities, potential injuries, and pain distribution at low back and knee. Also, secondary ligamentous and cartilaginous injuries can be preventable . Another common foot problem is pes cavus. Patients refer to podiatric clinics between the age of 8 and 12 years. The most common causes are musculoskeletal abnormalities like cerebral palsy (CP) and polio, lipomeningocele, foot fractures, tumors, and trauma to sciatic nerve. The problem can also be idiopathic. If the problem diagnosed as a mild deformity, conservative treatments such as medical shoes and insoles are prescribed to treat the problem [14,15]. Several epidemiologic studies have been carried out in Iran about the incidence of flat foot. Emami et al. reported the incidence of 35.7% in primary school boys in Shiraz. All of the performed studies applied elementary and imprecise methods such as observation or used indices which are completely observational-based like Tachdjian method. Stamp-based methods known as foot prints have been also used . The major limitation of the previous methods is that they were time-consuming and not reliable. Nowadays there are precise methods for evaluating foot problems like computer-based scanner of “Alfoots” company. It is a friendly-user method provides researchers with invaluable data about foot abnormalities. We decided to evaluate the incidence of flat foot using 2-D scanner apparatus of “Alfoots” company for the first time in Iran and to compare our findings with previous studies. It was a cross sectional study conducted between February 2009 and February 2013. 1652 students at age 7-12 years were recruited from Tehran primary schools. Our randomization method was stratified simple randomization. After taking the list of all primary schools of Tehran, the candidate schools were randomly selected from the list. Stratification was used to be sure about the normal distribution of primary schools from different regions of Tehran. Before assessing the students, an informed consent was taken from their parents. The results of the evaluation were sent to parents. 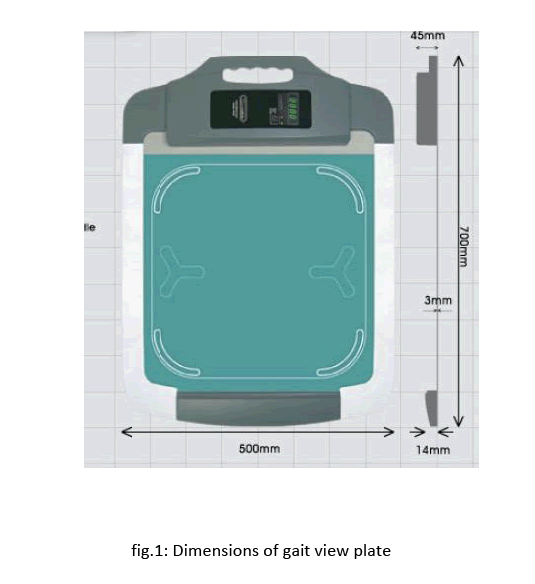 Alfoot 2-D scanner (GAIT VIEW, alfoots Co. Ltd., South Korea) includes a flat plate called “gait view”. In addition to foot problems, the scanner evaluates gait abnormalities, postural deficiencies, and balance abnormalities. The gait view is three mm height and designed ergonomically. It is portable and low weight (4.8 kg). The dimensions are depicted in figure 1. (fig.1). It is the thinnest designed plate all round the world. The apparatus assessment is carried out both dynamically and statically. Foot abnormalities were evaluated statically and center of gravity (CoG) was assessed as the dependent variable. Body mass should be distributed equally on both feet during quiet standing on the plate. Pressure points of different regions of sole are depicted using five different colors; each represented a certain amount of pressure. The colors are compared with those of normal data. The pressure points can be presented in a 3-D manner as well (fig.2). To evaluate foot problems, arms should be kept constant at the side of body. Obtained data were compared with normal ones and abnormality was diagnosed. SPSS (ver.18, SPSS Inc, Chicago, IL USA) was used to analyze data. Descriptive analysis of data was used in our study. 1652 students from the primary schools of Tehran aged 7 to 12 years old were recruited to participate in the study. Eight hundred and thirty children were suffering from foot abnormalities (50.3%). Most of them (789 cases) were diagnosed as flat foot (48%). 95% of the participants diagnosed with a kind of foot abnormalities suffered from flat foot. 41 of cases were diagnosed as pes cavus (≈2.5%). In our study, we evaluated the two commonest abnormalities: flat foot and pes cavus. Foot is predisposed to various abnormalities. Among them, flat foot and pes cavus are more prevalent but flat foot is the most common problem. Pes cavus occurs secondary to complications like CP or spinal cord diseases [7,8]. So, the flat foot has been the focus of most studies. Undiagnosis or misdiagnosis of flat foot has serious secondary complications especially later in life. 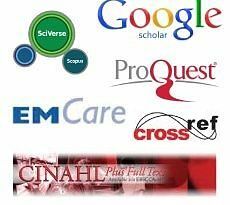 Most studies have applied non-precise & primary approaches. Emami et al.,  evaluated flat feet prevalence in 812 primary school boys of Shiraz. The applied method was the “Tachdjian” method. They reported that the prevalence of flat feet was 35.7 %. Tachdjian method is based on observation solely. Kamali et al.,  investigated the flat feet prevalence in 1132 primary, guidance, and high school students in Babol. They used “foot print” method which is a stamp-based method. The prevalence was reported as 11.8%. Foot print method is an ancient and non-precise method in comparison to our method. Also, it is time-consuming as implied in Kamali’s study. Sadeghi and Azadi nia  studied the flat feet prevalence among 671 primary and guidance school students in Isfahan. The age range was 7-14 years old. They used an uneven plastic board with a carbon sheet above. After standing on carbon sheet, the trace area of foot on another sheet was calculated. An arch index was then deduced. The prevalence of flat feet was reported as 23.5%. Their method was considered as a time-consuming and not reliable one. Akhavi rad et al.,  evaluated the prevalence of knee and foot deformities in 1000 high schools students in Tehran. The prevalence of pes cavus and flat feet was reported 0.2% and 11% respectively. Their limitation was that the observation method is not precise and reliable. Ali et al.,  determined the prevalence of flat foot in 714 Pakistanian primary school students. The prevalence of flat foot was 14.8%. Their reported prevalence was similar to the previous studies because they also used simple observation method. In our study, the prevalence of flat foot was reported as 48% which demonstrated higher flat foot prevalence in comparison to the previous studies. The observed difference can be attributed to different methods of measurement. Other studies used non-precise and non-reliable indices and methods in comparison to new technologies like alfoots. Most the methods were time-consuming as well. 1. It is not time- consuming in contrast to other evaluation methods. 2. It is a computer-based assessment method which is more valid and reliable in comparison to observational-based methods. 3. In contrary to the previous studies which were capable to evaluate just one kind of foot abnormalities, it can represent different kinds of foot abnormalities. 4. It is a portable apparatus. Milenkovic et al.,  investigated the incidence of flat foot among 228 high school student using a modern computerized podoscope known as Pedic. Flat foot was determined in 48.7% of the participants. Our study is in agreement with them as the obtained incidences of flat foot are approximately the same. Pfeiffer et al.,  investigated the prevalence of flat foot in 835 Austrian pre-school aged children. 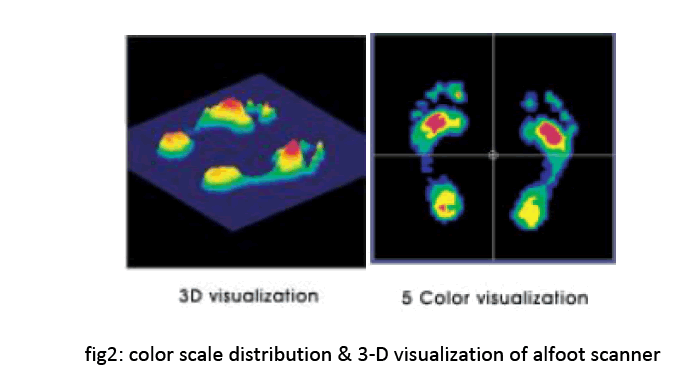 Children’s feet were scanned using a 3D laser surface scanner. The prevalence of flat foot was 44%. It is in line with our study and demonstrated that applying new technologies resulted in higher reported prevalence of flat foot. The observed difference between reported percentage of studies using newer technologies and the previous ones cannot be attributed to chance. Using conventional methods would result in underestimation of the prevalence of flat foot and its serious secondary complications like gait disorders. Our study had some limitations. The major limitation was the lack of control group. If we had control group, direct comparison among various methods have been possible simultaneously. Because of time limitation of the students, it was not possible to apply other measurement methods. Because of the novelty of the used method, head of schools were worried about the safety problems of the apparatus and it took us a long time to have their satisfaction and get informed consent of the parents of students. Also we did not differentiate between flexible and rigid flat foot. More recently a number of observational assessment scales such as Foot Posture Index (FPI) and Paeditaric Flat Foot Froforma (pFFP) have been developed to address the issue of poor reliability of foot measures but their validity and reliability is not studied yet. [21,22] It would be favorable to determine the correlation between these assessment scales and new technologies for investigating flat foot. Early diagnosis of flat feet is necessary issue. Reviewing the secondary complications of the problem, clarifies the importance of misdiagnosis. Early diagnosis can be provided using novel and precise technologies like alfoots. Mortazavi SMJ, Spandar R, Baghdadi T. Flat foot in children: How to approach? Iran J Pediatr 2007; 17(2): 163-170. Nemeth B. The diagnosis and management of common childhood orthopedic disorders. CurrProblPediatrAdolesc Health Care 2011; 41(1): 2-28. Jakson J, Stricker S. Pediatric foot notes: A review of common congenital foot deformities. International Pediatrics 2003; 18(3): 133-40.
calcaneal osteotomy reduces the excess forces in the medial longitudinal arch of the flat foot. Clinical Biomechanics 2001; 16(6): 535-9. Hunt A, Smith R. mechanics and control of the flat versus normal foot during the stance phase of walking. Clinical Biomechanics 2004; 19(4): 391-7.
functional evaluation using pattern recognition of ground reaction date. Clinical Biomechanics 1999; 14(7): 484-93. Cohen-Sobel E, Giorgini R, Velez Z. Combined technique for surgical correction of pediatric severe flexible flatfoot. Foot Ankle Surg1995; 34(2):183-94. D’Amico JC. Developmental flat foot. ClinPodiatr 1984; 1(13):535-46. Emami MJ, Emami S, Mohammad Hosseini M. Evaluation of the prevalence of flexible flat foot in primary school boys of Shiraz. Journal of Medical Research 2004; 3(4): 59-66. Pfeiffer M, Kotz R, Ledi T, Hauser G, Sluga M. Prevalence of flat foot in pre-school aged children. PEDIATRICS 2006; 118(2): 635-639. Amador EV, Sanchez RFS, Posado JRC, Molano AC, Guevara OA. Prevalence of flatfoot in school between 3 and 0 years. Study of two different populations geographically and socially. Colombia Medica 2012; 43(2): 141-146. Chen JP, Chung MJ, Wang MJ. Flatfoot Prevalence and Foot Dimensions of 5– to 13-Year-Old Children in Taiwan. Foot and Ankle International 2009; 30(4): 326- 332. Gross KD, Felson DT, Niu J, Hunter DJ, Guermazi A, Roemer FW, et al. Association of flat feet with knee pain and cartilage damage in older adults. Arthritis Care Res (Hoboken) 2022; 33(7):937-44. Tachdjian MO. Clinical pediatric orthopedics. 2nd.ed. Stamford: Appleton and Lange, CT; 1997: 54-55. Basil H, Derek W. The foot.4th.ed. Churchill Livingstone. Vol. II; 1998: 211-218. Kamali N, Haji Ahmadi M, Janmohammadi N, Kamali A. Assessment of the prevalence of flat foot in primary, guidance & high school students of Babol. Journal of Babol University of Medical Sciences 2007; 9(6): 50-54. Sadeghi E, Azadinia F. The prevalence of flat foot among 7-14 years old students of Isfahan. Journal of medical Council of Islamic Republic of Iran 2012; 29(2): 142-149. Akhavi rad MB, Mehdi barzi D, Jashan S, Radmanesh M. The prevalence of knee and foot deformities in high school girls of 5th region of Tehran. Hakim Medical Journal 2006; 9(2):18- 24. Ali M, Asadullah M, Amjad I. Prevalence of the flat foot in 6-10 years old school going children. Rawal Medical Journal 2013; 38(4): 385-387. Milenkovic S, Zivkovic M, Bubanj S, Zivkovic D, Stankoviv R, Bubanj R, et al. Incidence of flat foot in high school students. Physical function & sport 2001; 9(3): 275-281. Evans AM, Nicholson H, Zakarias N. The paediratric flat foot peroforma (pFFP): improved and abridged following a reproducibility study. J Foot Ankle Res 2009; 17(2): 2:25. Evans AM, Rome K. A Cochrane review of the evidence for non-surgical interventions for flexible pediatric flat feet. Eur J Phys Rehab Med 2011; 47(1): 69-89.